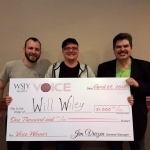 This year for the WSJY Voice was bigger and better than we have ever done it. We had brand new stops, more participation than ever on our voting pages for each week, an absurd amount of prizes, and more to make this the biggest year of the WSJY Voice. Without our listeners and our staff we wouldn’t have been able to pull it off so Eric and I wanted to take the time to say thank you. Thank you to all of our stops this year: Knutes Bar and Grill in Orfordville, Bazinga in Janesville, Sneakers in Janesville, Midpoint Eatery and Sports Pub in Johnson Creek (where our winner Will Wiley qualified) Creekview Par Three in Edgerton, Anchor in Newville, Pettit’s Countryview in Milton and of course, our finale at 841 Brewhouse in Whitewater. We packed these places each night and appreciate all the work of the staffs to keep people fed, happy and drink in hand. Thank you to all our contestants who came out to sing and put up with Eric and I on a weekly basis as we try to keep the show moving along. Obviously without our singers we wouldn’t have a show and our Thursday nights would be a lot less entertaining. We hope you had as much fun and we did and hope to see you all again! Thank you to Jason from Wilder Entertainment for constantly providing next level entertainment each night of the WSJY Voice. He always kept us on our toes, and provided everyone with some laughs and of course a few performances of Foot Loose! Also, what an incredible sound and light show he put on at the finale, not to mention providing some haze for the stage! Since I always struggled to get his website right, I’m just going to make this paragraph a link to it. Thank you to Joe our camera man who made sure to get us the videos first thing so that we could get them up on the website for voting. The videos always turned out great and didn’t cause any issues which makes uploading them in the morning, loads easier for Eric. Finally, thank you to you, our listeners. It is incredibly cool to be able to come to these events and get to meet you and hear stories. Eric and I always enjoy getting to talk to listeners because we are normally stuck behind the microphone in studio, so to get out and meet our listeners is a blast! Thanks for spending your Thursday nights with us the past nine weeks (other than that week we took off for Easter) and participating in voting and giving us feedback. Like I mentioned before without you, none of this happens.